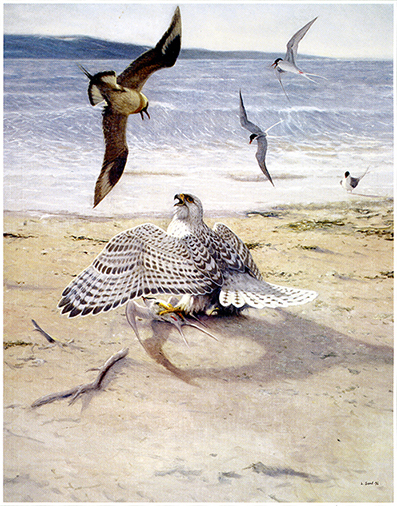 Lennart Sand is one of our most established and appreciated wildlife artists and he can be found in the permanent collections at Leigh Yawkey Woodson Art Museum, USA, Museum Nature in Art, England and National Museum of Wildlife Art, USA. He has over the years illustrated many wildlife magazines and recurrent written nature causeries in the daily press. Besides that he has also written and illustrated many books of his own. Lennart was born in Östersund in 1946 and resides in Dalecarlia. From early childhood I had a plan. I wanted to be a painter of animals and landscape. I admired my uncle whose paintings hung on the walls of our home and I wanted to be like him. My interest in nature has been accompanied by my devotion for art and painting. There has been no doubt what motifs I would choose. I belong to the egg-collecting generation and my biology teacher encouraged me to collect bird's eggs. It was a good hobby but I was not supposed to take more than one egg from each nest. When my friends played football I climbed up some tree and under a thrush's nest I was bombarded by the parents. I was top of the class in drawing and painting throughout the school but in other subjects I did not achieve good results. In my plan, there was no doubt about what I would do in the future. The only question was when. It took a few years before I could be a full-time artist. To begin with, I was an illustrator of magazines about hunting and fishing and a writer of articles about nature in newspapers combined with other jobs to survive. I was a waiter, a cook, a plastic worker, etc. But subsequently my paintings gave me an income and I could eventually, at the age of 31, put all other jobs to an end. I read everything that I could find about the development and history of animal and landscape painting and my rolemodels I found among the Swedes returning from Paris at the beginning of the 20th century and I was inspired by the way they painted landscape. I visited painters that I admired and among them was Lindorm Liljefors, the closest that I could get in comparison with Bruno Liljefors. I also had sporadic contacts with Björn von Rosen and became a close friend to Birger Stafås. Through Birger I learned a lot about the characteristics of painting nature but also how to approach nature that was appealing to me. We often painted and went fly fishing together. If felt empty the day that he put his brushes on the shelf for good. My own niche has over the years formed into two expressions. Landscape, where the mammals or the birds symbolize a smaller part of a full experience is one. The other on is action scenes with birds and mammals in different situations, often with some kind of excitement between pray and attacker. I heard, what kind of moss that I walked on or the name of the dragonfly that rode on the foam of the stream. I loved words like ornithologist and limnologist. Eventually I came to understand that my call was to describe experiences in nature rather than being a scientist. Here and now - tell the story about what you see - dererum naturae. 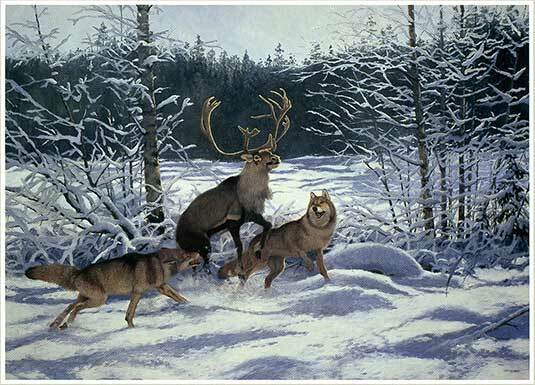 WOLVES and REINDEER Oil painting 210x340 cm. What I have wanted to convey as an artist has always been obvious to me even if it has been changed due to personal experiences and impressions. My problem has rather been how best to reach other people with my idea or my message. To me my mission has not only been to describe my experiences from the bottom of my heart but also to lead the beholders (the viewers) with my technique. To me every picture is crystal clear when I start painting. There is a saying that art shall not only entertain but also educate. I find that hard to understand. Introvert painting can without doubt entertain but in what respect does it educate? RED FOX and GOSHAWK Oilpainting 100x140 cm. In the early 1990's the Swedish Television 2 produced a series about hunting, dogs and wildlife - "Time for hunting". The recordings were made in my studio in Österå, Dalarna, where I lived at the time. 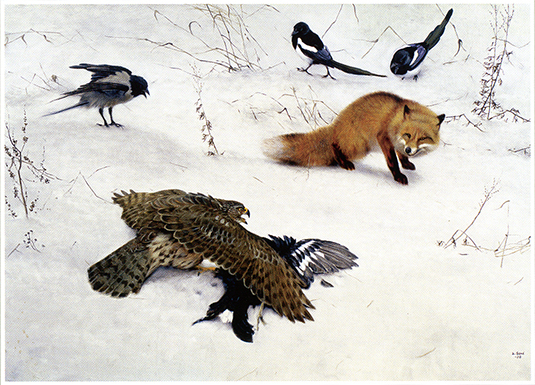 The concept for the production was to compare ways of hunting and attitudes toward hunting in Sweden and other countries. We travelled around and filmed and painted. The film maker Erik Fernström and myself took part in the expeditions. When the money ran out the production was ended. But Erik and I continued to travel on our own to film and paint. 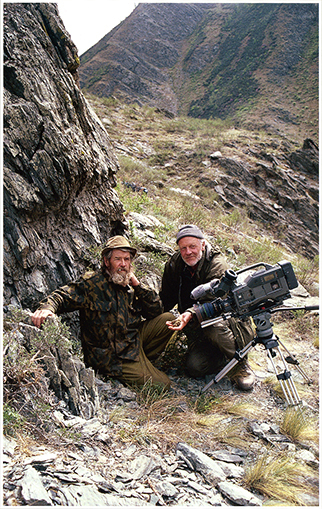 Boris Petrovich Savatsky and I in Sayan Shushenski Sapovednik 2002. In 1984 I participated for the first time in a group exhibition in London. It was in an annual reccurring exhibition arranged by the "Society of Wildlife Artists". The person who recommended me was the manager of Tryon and Mooreland Gallery, major Brian Booth, who later established the Holland & Holland Fine Art Department, where I had the pleasure to exhibit my paintings in 1995. In 1986 I was nominated for the first time to be a part of "Birds in Art", a tourin exhibition with some 100 painters and sculptors, which every year starts in the town of Wausau in the state of Wisconsin. In 1992 I had my first separate exhibition in the U.S. It was at the Grand Central Art Galleries in New York. I was then invited to be a member of the "Society of Animal Artists". Since then there have been many group and separate exhibitions all around the world, mostly in Europe and in the U.S. In 1989 the SWAN museum, the “Society of Wildlife Art for the Nations" in Glouchester, England bought a large oil painting depicting a golden eagle for its permanent collections. The Leigh Yawkey Woodson Art Museum has two oil paintings and the National Museum of Wildlife Art in the US has one, purchased in 1990, in 1996 and in 2003. In 2003 I was aksed to exhibit my paintings from my trips to Siberia during the St. Petersburg 300th anniversary. But we must not forget. 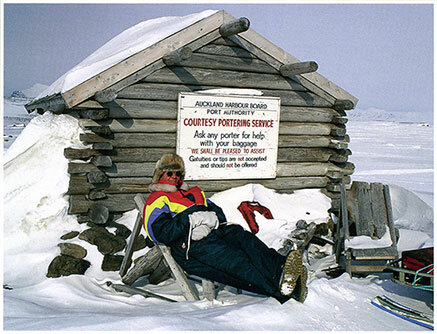 I have once exhibited my works of art at Longyearbyen, 1300 kilometers from the North Pole. Paintings that were completed during earlier trips to Spitzbergen. And, if the museum has not been burned to the ground, there is still a small painting there too.